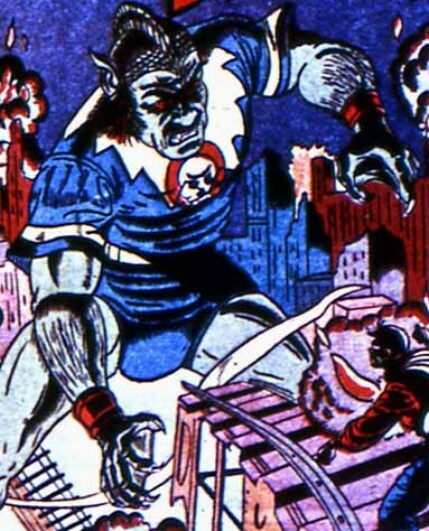 Powers/Abilities: Twenty foot tall giant, superhumanly strong. Unaging and immortal unless slain by injuries. Can be wounded by bullets, but not fatally, and swiftly heals. History: In primordial times the Demon caused chaos on countless worlds before he was defeated by an immortal magician, the Prince of Good, and imprisoned in a cave on Earth in what eventually became the USA. During the early 1940s runaway orphan Davey Drew came across the cave, and the Demon called to him through the wall that held him, convincing the foolish lad to free him. Grateful, the Demon promised to cause Davey no harm and gave him a cloak that would protect him, before going on a rampage. Regretting his mistake, Davey tried to stop the Demon, but found his attacks only annoyed the Demon, who tried to renege on his vow and slay Davey, only to be rebuffed each time by the cloak he had given the boy. Sensing his foe's escape, the Prince of Good appeared, and with Davey's aid, he battled the Demon and defeated him. The Demon escaped again several more times, each time being stopped by his two foes, until he finally appeared to perish while battling Davey in a remote underground cave; an errant blow by the Demon ruptured one of the cave walls, letting in the Colorado River, and seemingly drowning the Demon. Comments: Created by Howard James. Thanks to John Stoker for images and information.